Now that we’ve reviewed each of Destiny’s Exotic helmets (Titan/Hunter/Warlock), we’re going to review each of the Exotic gauntlets. Everyone knows Titan’s like to punch things, and the quicker you can do that, the better. These perks are useful in PvE as well as PvP. If you’re a Defender, and don’t have any Defender-specific Exotics (such as Helm of Saint-14), then pick these up. With No Backup Plans, your melee strikes can fortify you with a Force Barrier, giving you extra durability in combat. Depending on the talents you choose in your skill tree, you can have a regenerating FB, more reload speed or more Orbs of Light generated per use. The cosmetics for these gauntlets are very unique with their purple holographic illumination; they highlight the wearer well. Ruin Wings are the new Dark Below Titan gauntlets that are useful for either subclass. These will give an awesome advantage in PvP, but especially in PvE. 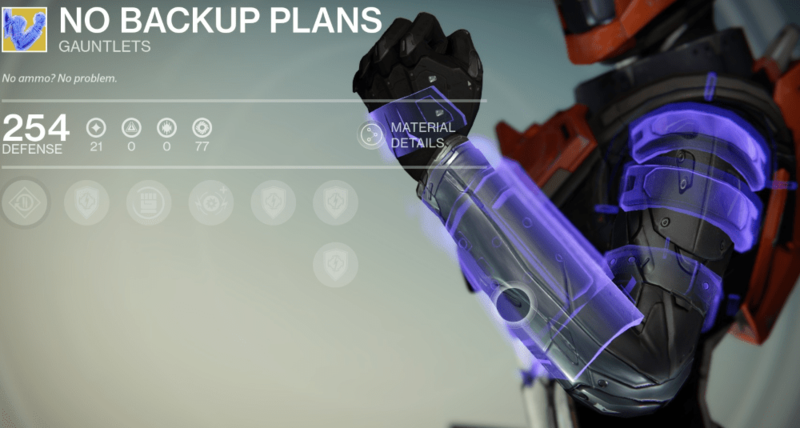 These gauntlets will get you more rockets and more bullets for your machine gun. Heavy ammo drops much more frequently and even doubles the amount you get from each crate. You will almost never have the need to burn through Heavy ammo synthesis packs since you’ll be consistently picking up ammo. Impact Induction offers the opportunity for melee-loving titans to get even more grenades to throw; you don’t even need to get kills with the melee, just cause damage. The Strength from it will reduce the cooldown of your melee ability; we all know a Titan loves to melee! This is one of the best Titan Exotics since The Armamentarium. It gives you a huge edge since you will have an endless stream of heavy ammunition at your disposal. Obviously in PvP enemies don’t drop heavy ammo automatically, so these would be best in PvE, though you could still benefit from the other 2 perks. As for cosmetics, this gear doesn’t disappoint. Amazingly designed, engraved armour plates make your titan look broader and more prestigious. These gauntlets are easily identifiable and are bound to make you stand out among the crowd, with a very similar design as the Mk. 44 Stand Asides. Improved Tripmine Grenade – Tripmine grenades last longer when placed. 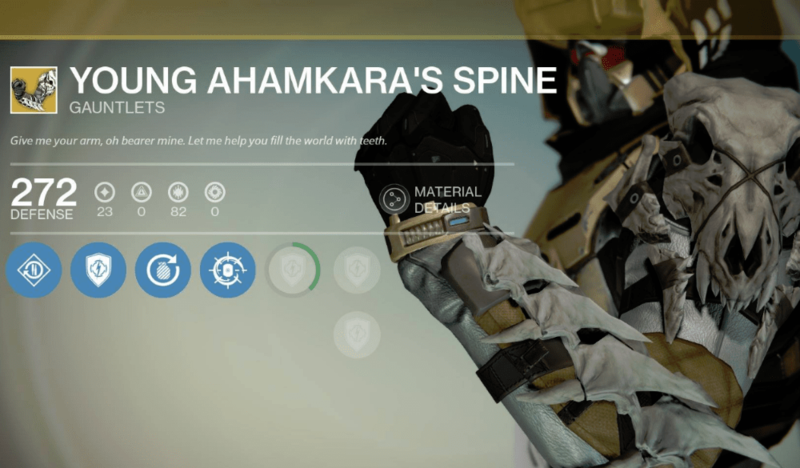 Young Ahamkara’s Spine will double the time your the tripmine lasts for, just like the Sunbreakers with the Solar grenade. With Tripmines this is especially useful, lasting a total of 30 seconds, if you’ve got enough Disipline you can breifly have 2 out at once! What is also great on these is the Ashes to Asset perk, which gives you more super energy for grenade kills. It’s always good when the perks support each other, and with enough Discipline, you’ll be able to have 2 tripmine grenades out at once for a few seconds. The typical Special Weapon’s Loader perk will reduce the reload speed by about .7 seconds. These gauntlets lose some credibility in PvE as Tripmine grenades are not a popular choice due to their singular targeting habits and are usually swapped out with something that provides more area of effect damage. These are OK gauntlets, but ultimately we recommended that you wait for an Exotic helm such as Achlyophage Symbiote. As for looks, these are the probably the coolest gauntlets in the game. From the spooky moving spine on the arm, to the vicious and intimidating skull on the shoulder, it’s no surprise why most people use these as their Cosplay inspiration. Don’t Touch Me are PvE-focused gauntlets that are subclass neutral. While these technically aren’t a Bladedancer-only item, Bladedancer’s will benefit more from Defensive Reflex using their Shadowjack talent. 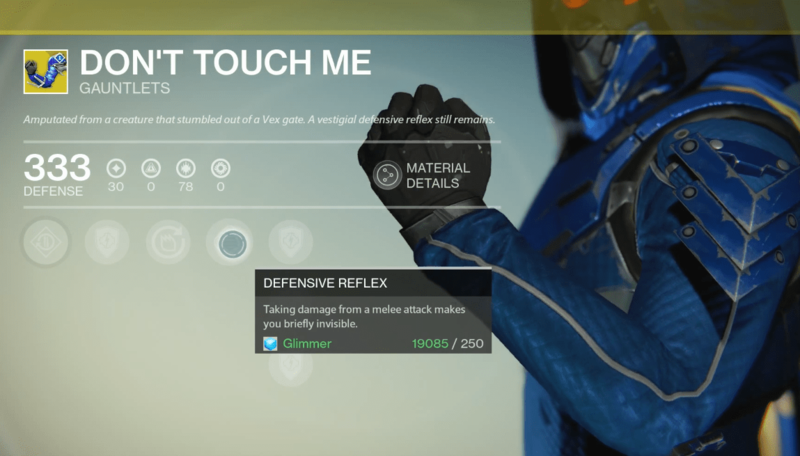 Do not underestimate the Exotic perk on the Don’t Touch Me gauntlets. It’s insanely good in certain situations, and allows you to do things you could never do before. If you wanted to, you could solo the first part of Crota’s End without breaking a sweat! When you are struck by melee, you are granted 3 seconds of invisibility (6 seconds using Shadowjack). There is no cool down either, so the moment you are exposed, you are lined up for yet another vanishing act the next time you’re struck. This sort of ability is absolutely priceless in PvE. It’s a great perk that will allow you to escape those sticky situations. The other perks are fairly standard for Exotic gear: Inverse Shadow will give you a great boost for PvE when you want to get those Supers back extra quick. With increased reload speed for Snipers, Fusion’s and Shotguns, you are given another all-round great boost. There’s no perks that benefit your grenades, but if you are lucky enough to get a pair with a high amount of Discipline, they’ll help with their cooldown. These gauntlets are more orientated around PvE, since Guardians usually only melee when they are going in for the kill, so keep that in mind. As for Inverse Shadow, that perk won’t benefit you at all in the Crucible. Don’t be fooled by the preview: You will be presented with a pretty boring shoulder plate, but on the right shoulder, you have a large scarab-esque mandible extruding upwards. It looks pretty cool to say the least and is noticeable. 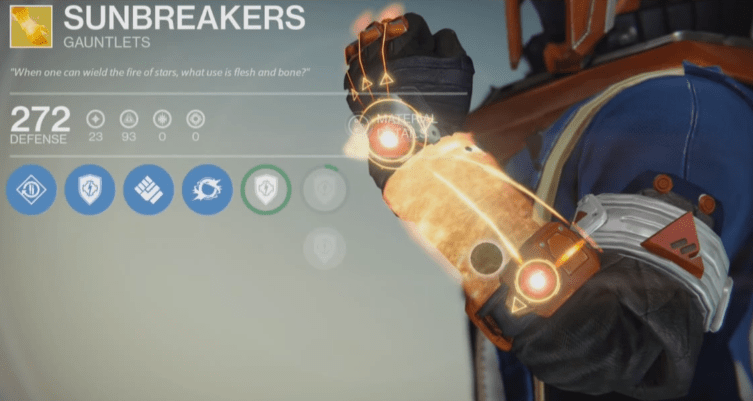 The infamous Sunbreakers… love or hate them, if you’re a Sunsinger you should have these. The perks these provide are fantastic if you set your talents right. Helium Cycle exactly doubles your Solar grenade’s duration. Unfortunately it doesn’t affect Dragon’s Breath solar flare. An additional Solar grenade with Gift of the Sun is crucial if you want to take advantage of Sunbreakers‘ perks. Song of Flame and Radiant Will are also great as they will have Radiance last longer and have your grenades recharge faster. In PvP and PvE alike, Sunbreakers give the same benefit. More control over areas and more damage output for your grenades. The Solar grenade can be useful in encounters when enemies come through predictable chokepoints, and for bosses that have multiple points that can be damaged simultaneously such as the Devil Walker. Aesthetically, they’re amazing. The bright orange fiery plates will never go unnoticed. If you have the chance to buy these, do it. 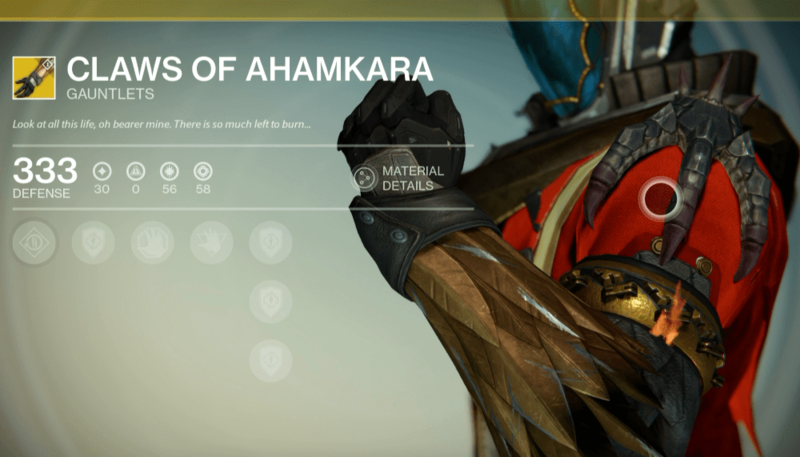 The Claws of Ahamkara perks will help out in PvE and PvP, and the they also look great. The Warlock melee is arguably the most versatile in Destiny, and having two charges that can be doled out faster than normal makes it even better. If your melee ability isn’t up, these will help you squeeze out in a close quarters fight. Having a perk benefit both subclasses is very rare with Exotic pieces of gear,and it’s nice because you can choose which you prefer. It maintains a perfect balance between the two, so players have complete flexibility over which class to play and won’t be left with a useless Exotic if they wish to change subclass. Unfortunately each of the perks relies on getting up close and personal. In PvE activities, especially in the most dangerous scenarios, usually you’ll want to avoiding getting in the enemy’s face. Cosmetic wise, they cover the forearm with elegantly placed feathers and the Claw upon the shoulder is a very impressive and visually appealing. Previous Post:Acolyte Helmets are Nailed On! ?